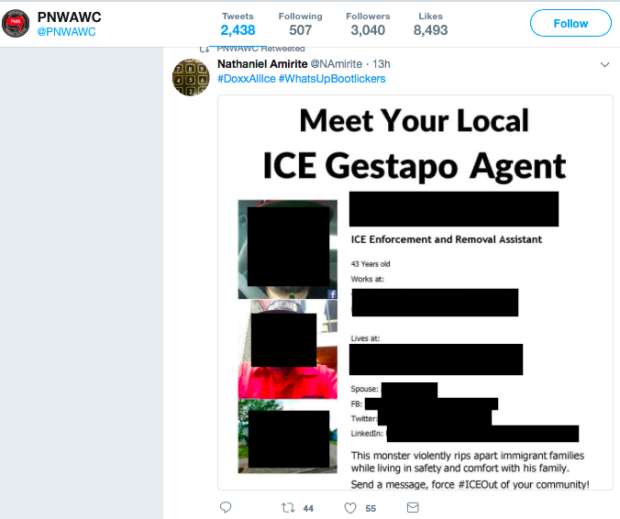 An Antifa-linked Twitter account has taken doxxing Immigration and Customs Enforcement (ICE) officers one step further by publishing their home addresses Wednesday. The names, pictures, spouses and home addresses of seven ICE employees in Oregon were originally tweeted by user @NAmirite, who identifies himself on Twitter as Nathaniel Amirite. The account was retweeted by the Pacific Northwest Antifascist Workers Collective and @PNWAWC on Twitter. Antifa groups have previously come under fire for doxxing, or revealing personal information, of several ICE employees. Antifa members circulated a database of all of the public LinkedIn profiles of ICE employees on Twitter on Tuesday. The link to the list, which was previously was posted on Medium and GitHub, now directs to an error page.